Compact yet very effective, HORIZON CONTOUR is a linear LED system made of high-grade extruded aluminum. It is available with a various choice of optics and lenses to provide incomparable control of light intensity and quantity. 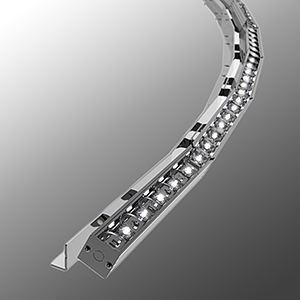 Offering a wide range of beams, HORIZON CONTOUR is specifically created for precision lighting by allowing tilt and curve adjustment, optimizing the light produced into the unique installation environment. The peculiar bracket allows an on-site curvature as well as tilt adjustment, 90° exterior and 10° interior. X= Extrusion in increments of 4” or 8”.